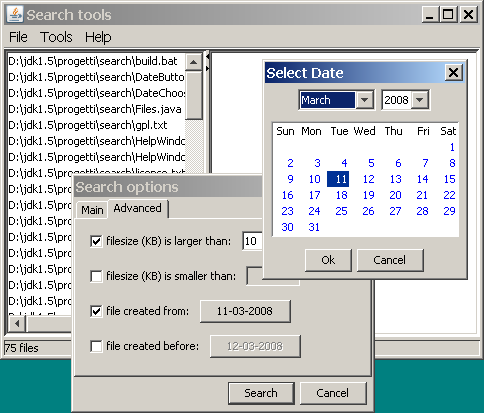 Search is a program that searches files matching user specified criteria, executing specific actions on the files matching the criteria. It is possible to specify the text to search, the pattern of the filename (that can include wildcards like * and ? ), it is possible to specify a recursive search and if the search has to be casesensitive. It is also possible to specify a range for the filesize and for the time stamp of the files. The program has been verified with the operating systems Windows 2000 and Windows XP.